Filling Spider-Man: Homecoming with Easter Eggs and classic references wasn't enough: it's time to pay tribute to the movies that inspired it, from Breakfast Club to Taxi Driver using the stars themselves. Fans of the Marvel Universe have more than one reason to be thrilled at Spider-Man: Homecoming's runaway success. Not only does the future for Spider-Man look brighter than ever, but the movie itself is jam-packed with homages to classic Marvel Comics, proof that Thor has worshippers on Earth, and so much more. Now, the positivity and professed love of all things John Hughes, comic books, and 1980s pop culture has manifested in a new bit of Spider-Man goodness. It's one thing to know that the best high school films of the past four decades helped shape director Jon Watts's version of Marvel's resident webslinger. But to see those films recreated with the Homecoming cast is something else, entirely. The new batch of love letter posters to the classics of the 1980s comes courtesy of Nerdist, throwing the movie's hero and supporting cast in alongside the likes of The Breakfast Club, and Ferris Bueller's Day Off. 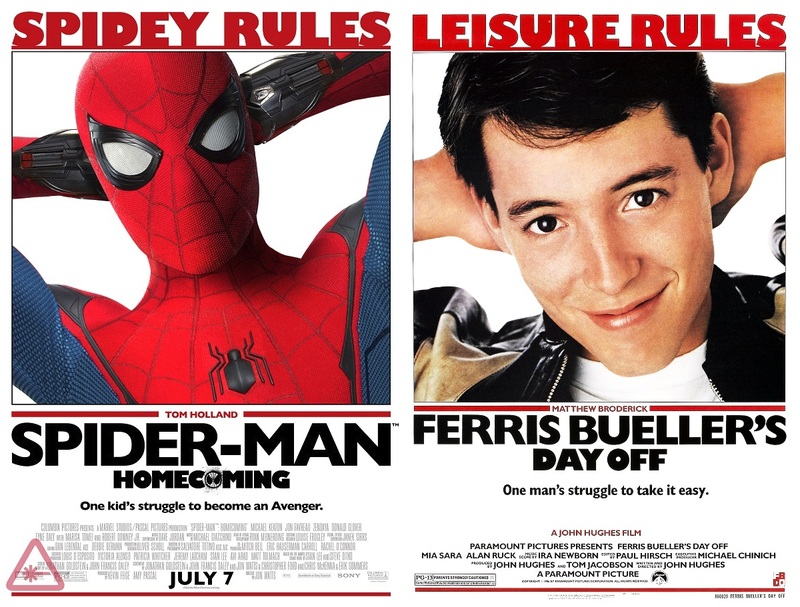 The choice of tributes is a bit meta in itself, considering that the movie actually includes a shout-out to Ferris Bueller that is so obvious, it's hard to even justify calling it one of Spider-Man: Homecoming's best Easter Eggs. When Peter Parker finds himself forced to run on foot through a suburban neighborhood, his disastrous trip over fences, into pools, and through barbecues is an overt reference to the same scene in the closing act of Ferris Bueller. The tale of "one man's struggle to take it easy", like Breakfast Club, is also one of the defining movies of director John Hughes's film career. 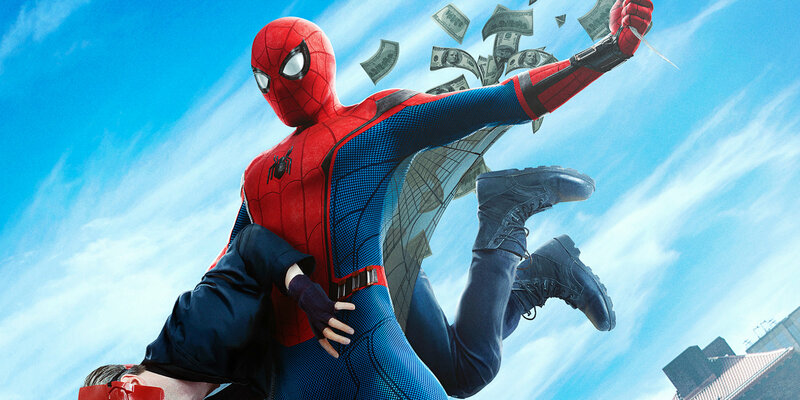 A career looming so large in the world of high school coming-of-age stories that director Jon Watts openly admitted Hughes was a major Spider-Man: Homecoming inspiration in general. Seeing the connective tissues may be difficult when Peter is swinging through the streets of New York or conversing with Iron Man, but these posters drive home just how informed by Hughes's filmography it is. Although Liz (Laura Harrier) isn't quite as troubled as Molly Ringwald's 'beauty,' and Flash Thompson (Tony Revolori) is more of a modern bully than a classic 'jock,' we have to hand it to the artists for singling out Peter and Michelle (Zendaya) as the 'brain' and 'recluse.' Of course, the real credit belongs with the astute observation that Ned (Jacob Batalon) is far more sensitive than his boss, rebellious, dominance-establishing, Indiana Jones-esque hat would imply. The real standout, for reasons obvious to anyone who has seen both movies, is the Taxi Driver tribute. We'll choose to take the design - swapping Spidey for Travis Bickle, and a school bus for the eponymous taxi - as an homage to New York City. The shared backdrop is certainly a more comfortable parallel than comparing Peter to a deranged murderer who wants New York to wash away into nothingness. These may be the first posters using the iconic imagery of Spider-Man and his lovable castmates to send-up or pay tribute to movies that tread similar ground (whether thematic or literal), but they won't be the last. Since the studio's marketing department already took the leap of releasing an official poster recreating Spider-Man's famous Amazing Fantasy #15 (1962), we would like to assume that fan mash-ups are explicitly encouraged. Which of these posters recreated by the stars is your favorite? Any other 1980s classics of movies referenced that you think should be next?